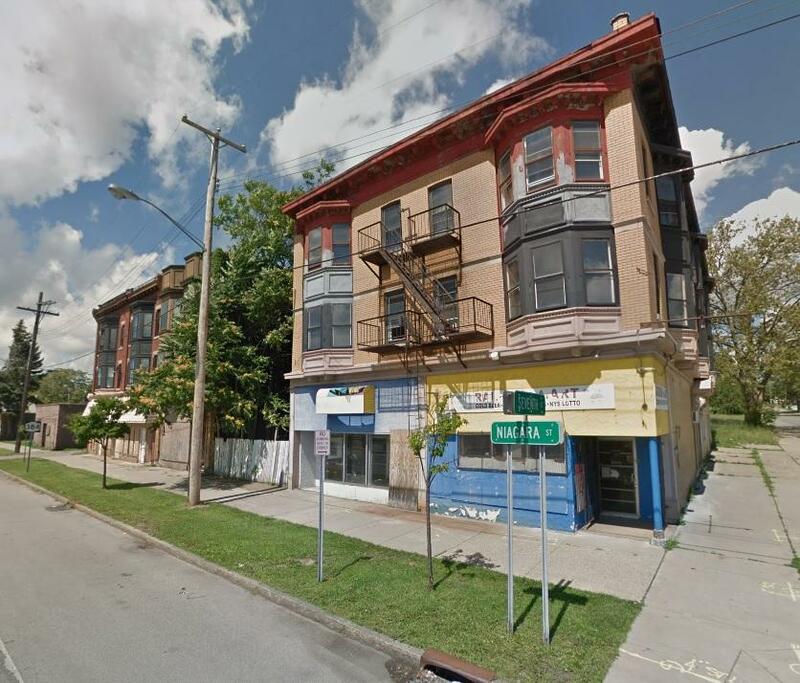 An organization that fosters public-private partnerships to enhance tourism in the City of Niagara Falls envisions the conversion of long-abandoned buildings at a high-traffic intersection into a mix of residential and business incubation space. The developer designated to rework numerous plots along Niagara Street is awaiting word whether they'll be granted tax breaks that will help the Niagara Global Tourism Institute realize its vision. The buildings to be redeveloped, located on Niagara Street at Seventh Street, were built in 1908. Plans include the introduction of 17 market-rate apartments, a cafe and office space from where startups will be encouraged to launch. A view of the buildings slated for rehabilitation and conversion into a mix of residential and commercial space by TM Montante. The Niagara Global Tourism Institute will run the office space, where startups will be encouraged to launch, including those working in tourism technology. That business incubation space will be managed by the Niagara Global Tourism Institute, which will relocate its own offices to the site. "If everything was perfect we'd have 50 percent of the tenants in the incubator in the tourism technology field and 50 percent of the tenants in everything else," said NGTI director Patrick Whalen. "The reason for that is we like diversity. We like diversity of thought, of ages, gender, race. The more diversity we have, the more innovation we get." The vacant buildings are an eyesore, Whalen said. They are also located in a neighborhood that's a short drive from the Rainbow Bridge, from where Canadian tourists arrive, and from John B. Daly Boulevard, from where many local motorists enter downtown Niagara Falls after traveling along the Niagara Scenic Parkway. TM Montante, the firm selected to redevelop several plots along Niagara Street, is hoping to break ground on redevelopment of this parcel by late spring or early summer. First, though, the firm is seeking various tax breaks to help move the project forward. TM Montante has approached the New York State Historic Preservation Office and the National Park Service with the hope the buildings may be added to the National Register of Historic Places. Achieving this would qualify the project for historic tax credits. "We are going to be saving, in large part, all of the existing building structure as it stands now," said Byron DeLuke, TM Montante's director of public affairs. "The exterior buildings will be a complete rehab. The interior will be a complete reconstruction along historical lines. We're going to end up with just really great spaces, both for the commercial tenants downstairs as well as the residential units." TM Montante has also applied to the Niagara County Industrial Development Agency for sales and mortgage tax abatements. The sales tax breaks would cover purchases of materials for the project. The IDA's next meeting is scheduled for mid April and a decision on the application, according to a source within the organization, is expected at that time. Whalen, who has been with the NGTI for a little more than two years, was asked whether Niagara Falls is truly witnessing a economic renaissance similar to one in Buffalo. He noted that the Cataract City has gotten away from the older mindset of seeking one big "magic bullet" and is seeing redevelopment based on smaller, diverse projects. He used baseball as a metaphor, likening Niagara Falls redevelopment to scoring runs by achieving a series of base hits, rather than trying for the home run. "The number of little tiny things that have been positive that have been happening on a pretty regular basis in the past 26 months," he said "When you add them up, it's pretty clear that Niagara Falls is right now turning the corner. I think this project symbolizes that." Niagara University will host a one-day professional development course in downtown Niagara Falls next month, featuring one of the biggest names in the entertainment and leisure business. Local organizers hope that once the name attracts participants, those guests will also get a look at the Cataract City's assets. The transformation that TM Montante Development is planning for a prime piece of real estate in downtown Niagara Falls includes a partnership with Niagara University. Most of the commercial space will be dedicated incubator space for NU's Niagara Global Tourism Institute. The former chief operating officer of the Buffalo-Niagara Medical Campus is now working to boost Niagara Falls. The Niagara Global Tourism Institute has tapped Patrick Whalen as its interim director. While it may be known as the "Buffalo Billion," New York State's large cash investment in Western New York includes other parts of the region. And elected officials say you're seeing a similar economic turnaround as a result, including one in Niagara Falls.